Years ago, when American and British radio was pervading the war-torn landscapes of Vietnam, Cambodia was also on the receiving end of these broadcasts. Hearing the sounds of surf and psychedelic rock n’ roll, some inspired Cambodian musicians incorporated this Western influence into their own traditional music, creating a new form of Cambodian pop. When Pol Pot came to power in the mid-70s, the Western influence was eradicated and a lot of these musicians were killed. Luckily, some of the recordings survived. Los Angeles sextet, Dengue Fever, rises from these ashes. Venus On Earth is their 3rd LP. Listening to Venus On Earth, you realize that some of its credit is undeniably owed to the historic events from which this music is born. It doesn’t stray too far from an established rhythm at any time, nor does it seem to offer any fresh ideas to contemporize itself (aside from mentioning “Ambien” and “e-mail” during the he said/she said love song “Tiger Phone Card.”) Some of the music herein reminds me of what the Beastie Boys were experimenting with on the Hello Nasty record, (refresh your aural memory with “Sneakin’ Out The Hospital” and “Picture This.”) Without the great back-story, do we really have a band worth discussing? The answer? Yes. 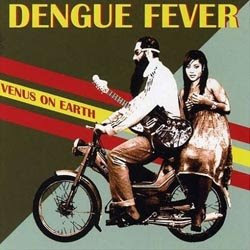 Despite a possible over-reliance on their source material, Dengue Fever do take a well-researched risk by bringing this oppressed and obliterated music back into some kind of limelight. And they do it well. There are at least four or five songs in Venus On Earth that almost seem destined to be re-sequenced amongst a plethora of other anonymous tracks for the next Tarantino soundtrack. And, yes, that was meant as a compliment. That being said, these actually wind up being the album’s highpoints as the English language tracks lack the poetry to match the music. It’s as if the group dumbs themselves down, opting for the overdubbed version of the foreign film because they hate to read movies. The aforementioned “Tiger Phone Card” for instance, pairs Nimol with guitarist, Zac Holtzman, as two long-distance lovers exchanging POV observations about their upcoming reunion. This dynamic is repeated for the “Drive My Car”-like, “Sober Driver,” where Nimol calls Holtzman for a ride ‘cause she’s had one too many. Hearing the two voices together…it’s as if someone thought David Schwimmer at his MOST whimpy and castrated could have a meaningful relationship with Sarah Conner at her MOST badass. Nimol seems the stronger of the two, the one with less drama. It’s possible that this is an attempt at modernizing the 60s gender-archetype by flipping the script on traditional roles presented in the common romance, but…I’m not buying it. I'm probably over-thinking it as it is. Surf-tracks “Oceans Of Venus” and “Mr. Orange” change up the pace, but not till the album’s just about over, which does little to enhance the opening half. As revival acts go, Dengue Fever has the most unique take. As opposed to the usual regurgitation of the Nuggets boxset that modern-day psych acts continually commit to tape, there’s actual history to follow in this instance and a chance to actually understand a different political climate. The problem with 60s rehashers is that they think the music only revolves around vintage instruments and paisley shirts with beads. The air back then is what made that music as powerful as it was. The Nuggets boxset, for instance, isn’t so much a collection of one-hit wonders as it is a documentation of a very turbulent era of social enlightenment and societal dismay. If you can capture that, then you capture the music. Dengue Fever seems to understand this. It’s not perfect, but at least they’re thinking.